All glass doors and glass walls are a bold look that provides unobscured visibility and natural light to create the best possible working environment. The use of structural or all glass systems is the best way to brighten spaces that don’t have exterior windows. Structural glazing systems typically use monolithic or single pane thick glass for a wide range of applications, such as glass walls, glass handrails, all glass doors, glass canopies. Tempered, heat treated or laminated glasses are typically required for these applications. For some structural glass facades, the use of framing can be very minimal. Some systems use glass fins set into specially designed glass to provide wind load resistance. 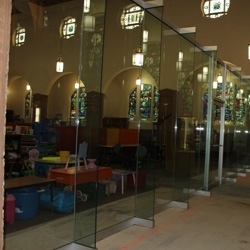 Heavy glass can mean either 3/8”, ½”, 5/8”, ¾” or even 1” thick single panes of glass. The thicker the glass the stronger it is, which may be needed for larger sized pieces. With using heavy glass, the glass edges are typically exposed which need to be finished by grinding or polishing for the best look. The glass edges can also be mitered when needed to form a crisp corner. There isn’t a type of use for glass that we haven’t been involved with in the course of our 90+ years in the glass industry. Because we have installed so many projects using heavy glass we understand what to expect, how to get it laid out and install to spec. Let us handle your next heavy glass job.